Italian is one of my favorite cuisines and I could probably survive on pasta alone. Basically, I love carbs, in any form. The tricky part is that they tend to love me too...and stick around! I always figure that if lean protein is added to pasta it sort of balances out that carb equation (see earlier post for my logic on girl math). 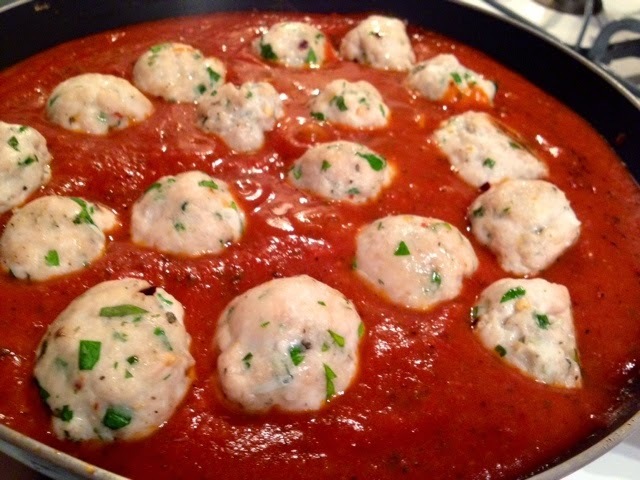 One of the best and truest Italian staples is the meatball. Have you ever had one that was just so light and flavorful that it blows your mind? I have. And normally they are loaded with milk soaked bread, cheese, and some type of binder. 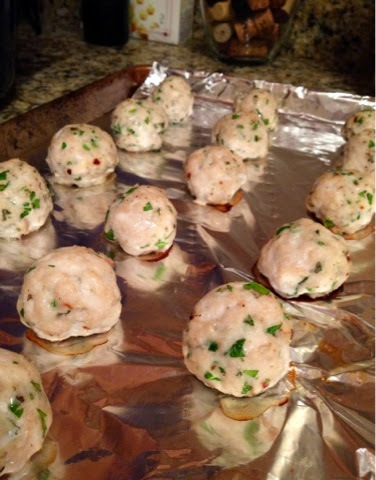 Although I'm not Italian I think I've mastered a pretty good meatball that is healthy, free of dairy, and gluten. These are so delicious and come together quickly for a great weeknight meal. For the meatballs I used a large mixing bowl and added everything in at the same time. 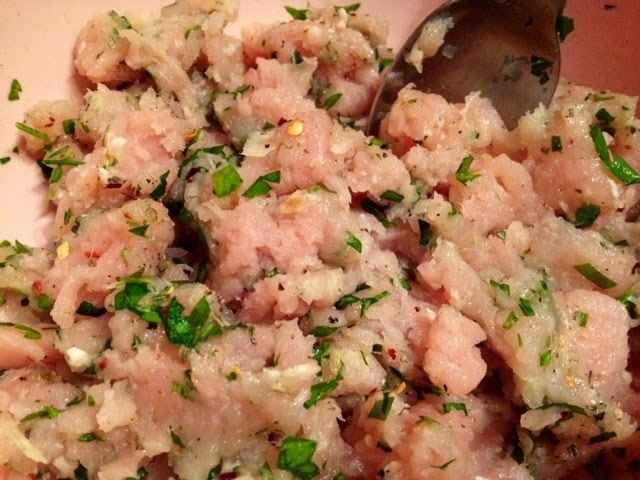 I started with a 20 oz package of lean ground turkey breast and to it, added, a clove of garlic and about a tsp of onion (both grated),1 Tbl fresh chopped parsley, 1tsp fresh chopped basil, salt and pepper, a sprinkle of dried basil and oregano, and plenty of red pepper flakes. 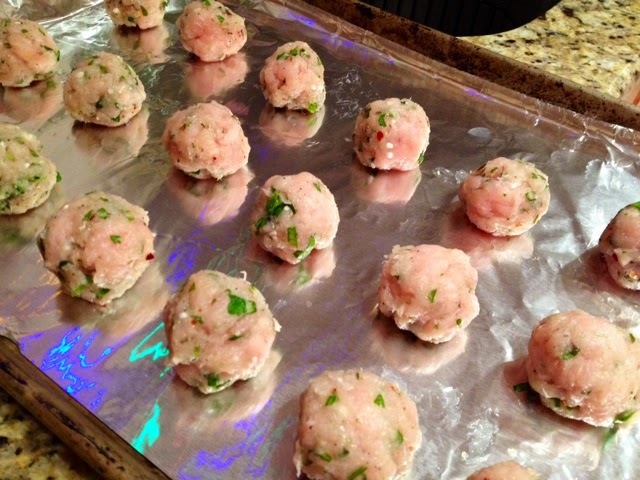 Mix it lightly, just until combined and scoop the size meatballs to your liking. I prefer smaller meatballs so you get more! Place on a foil lined baking sheet and cook in a 425 degree oven for about 12-14 minutes depending on the size. Pull them just slightly under completely cooked and plop them in the simmering marinara to soak up those wonderful flavors. Read on for my marinara recipe. I always find myself pressed for time and turn to regular store-bought marinara for weekday cooking but what I do to it tastes homemade, like I've been simmering it for hours. Love those semi-homemade tricks! 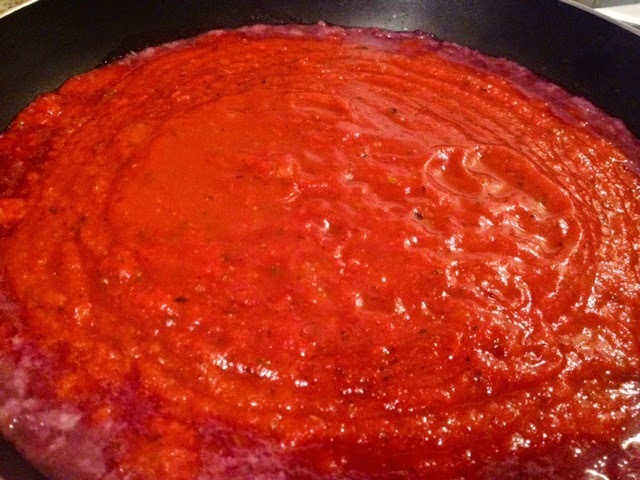 Here's how I made my sauce, aka gravy to those Italian readers. 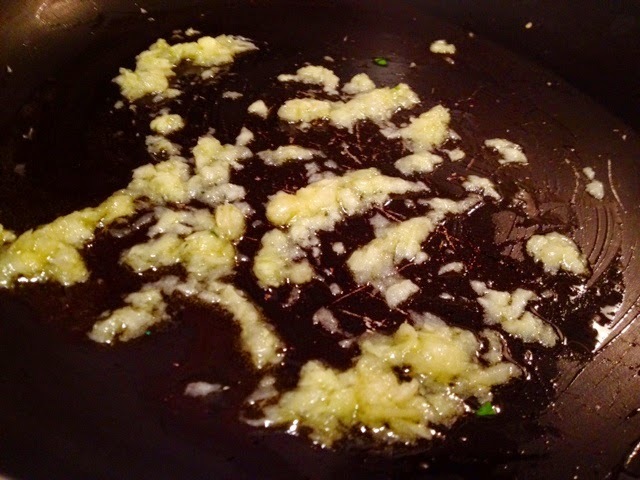 In a sauté pan add a tablespoon of olive oil and 2 cloves of garlic and 1 tsp of onion grated. I would normally add the onion minced because I like the texture it gives but Sean can detect any trace of onion so I sneak it in. Sauté on low for a minute or two and deglaze the pan with a little wine. I used red because it was open and in my wine glass but you could use white as well. 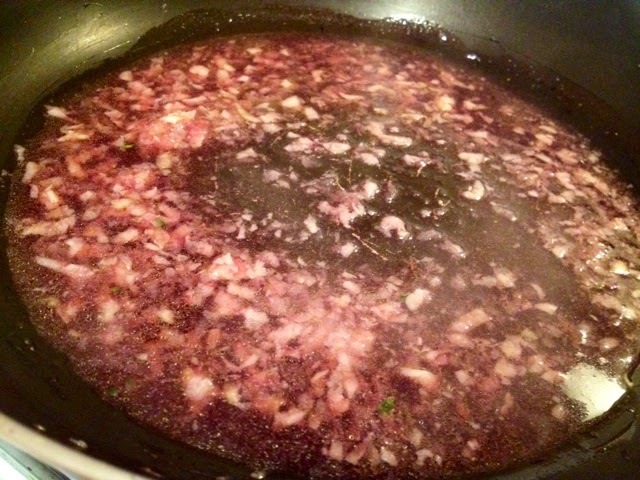 Reduce the wine to about half and add your jarred sauce. 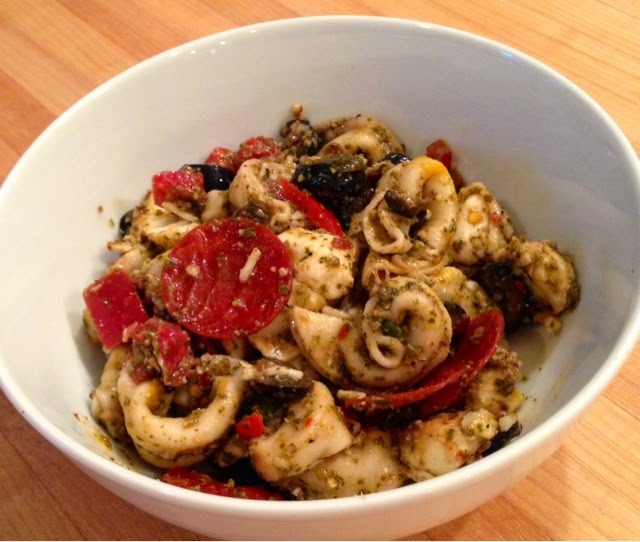 Season with red pepper flakes, salt, and pepper and finish with fresh herbs like parsley and basil. That's it! Takes about 6 minutes and jazzes up any sauce. 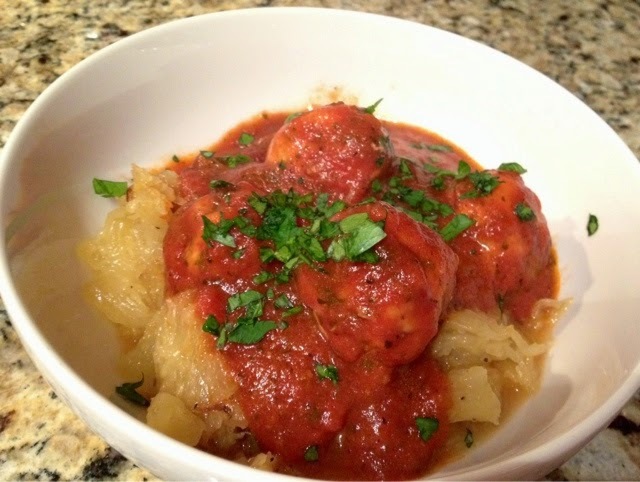 Or serve over roasted spaghetti squash "noodles" for a healthier meal. 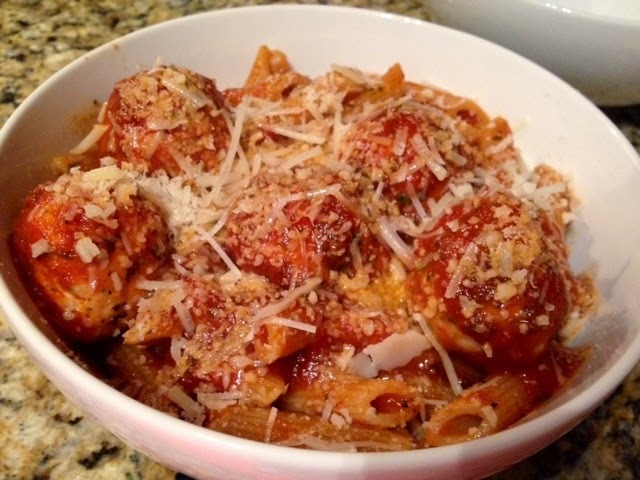 *still delicious even without Parmesan, although a little sprinkle would take this over the top! Sigh. It was good! But not as good as his I'll bet! There's something about going home that puts you at ease and just makes you sigh of relaxation. This is absolutely true about coming home every night but I'm talking about your childhood home. 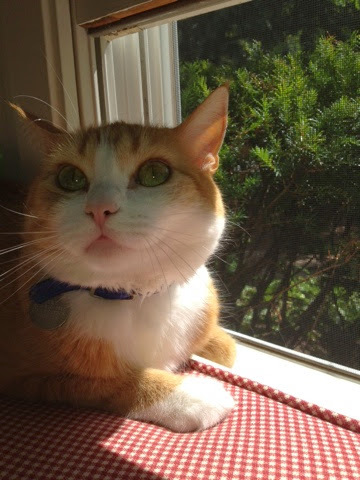 Even though I no longer live at my parents house I sometimes feel homesick for that "homey" feeling. You know what I'm talking about? I'm sure it's a combination of memories and the welcoming arms greeting me but there's truly no place like home. I haven't even been out of the house for too long but especially during the holidays it makes me miss it! 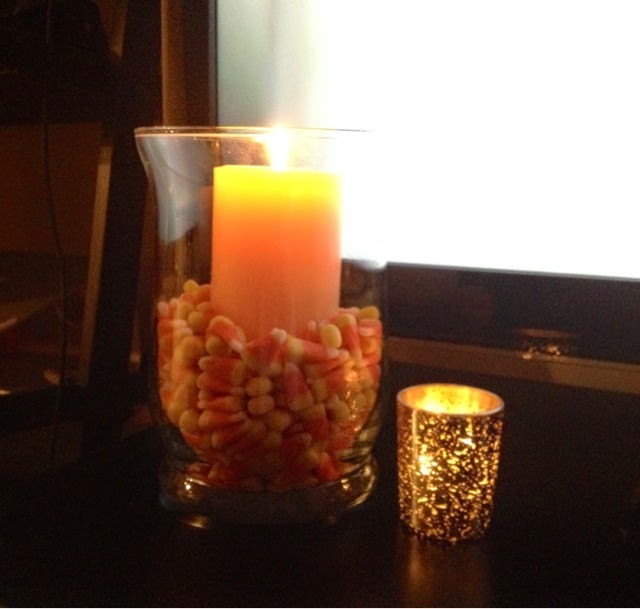 These beautiful fall days we've been having have really inspired me to make this (1 bedroom apartment) a home. I bought a pumpkin and mums for outside, got crafty with a candy corn filled hurricane (it's all over Pinterest) and tonight made banana bread, just like my mom's. Let me tell you, the aromas filling my apartment were amazing! 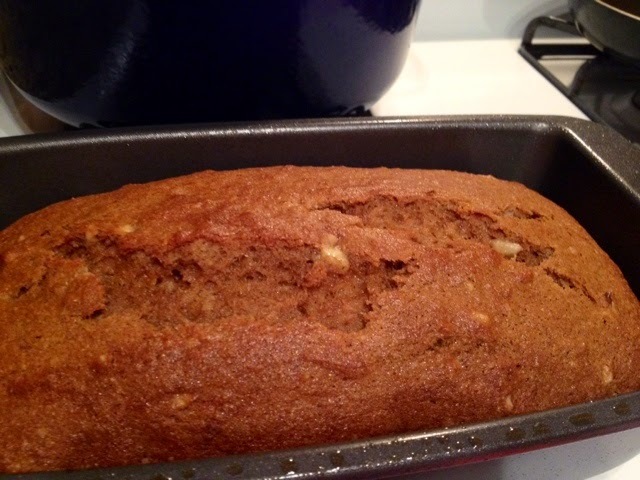 I had 2 bananas that were just past that perfectly yellow stage and needed something to do with them and right away I headed to my parents for my mom's banana bread recipe and to borrow her loaf pan...I can't tell you how ecstatic I am to register for these things! 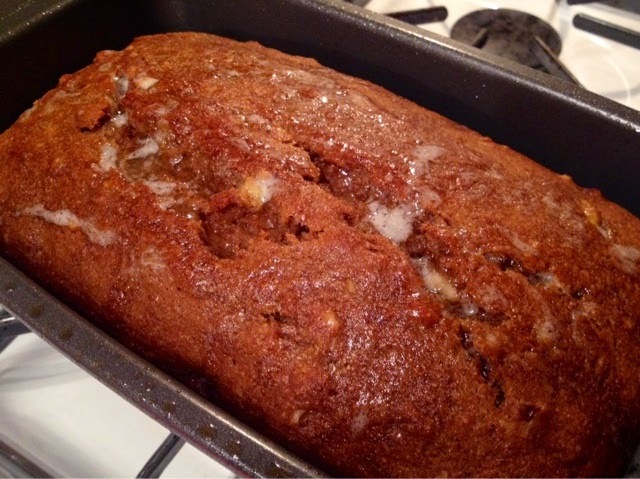 The nice thing about this banana bread is that it freezes really well. After it cools completely wrap it tightly in foil and place it in a large Ziploc bag. This is great portion control for me! I can cut a few slices, freeze the loaf, and save the rest for later! 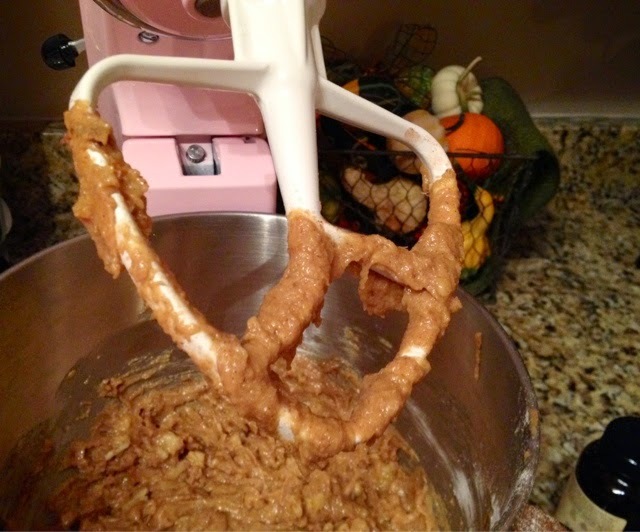 I used my KitchenAid because I love an excuse to use it, but this can also be done with a hand mixer or even by hand with a wooden spoon. 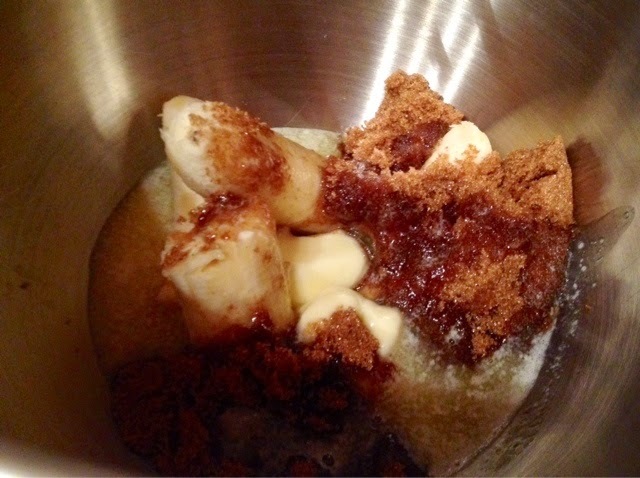 Start by mixing 2-3 very ripe bananas with 3/4 cup of brown sugar and 1/2 cup of melted butter. Beat this for about 2 minutes or until well combined. *If there are a few small chunks of banana still, that's okay! 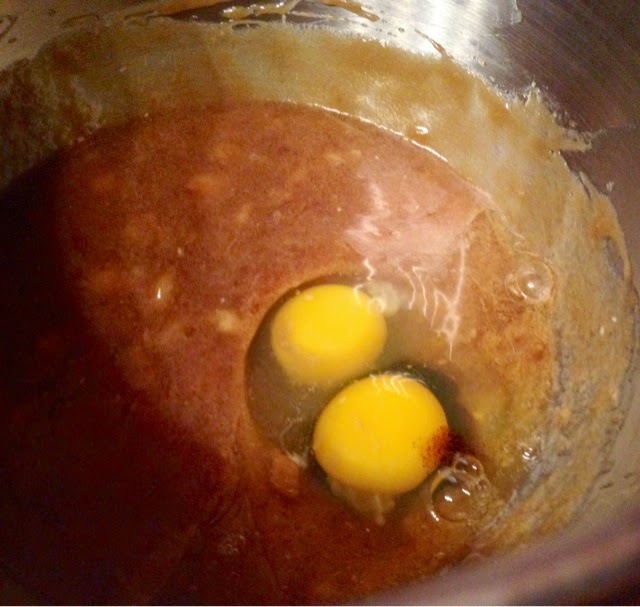 Now add in 2 eggs and 1 tsp vanilla extract or paste. 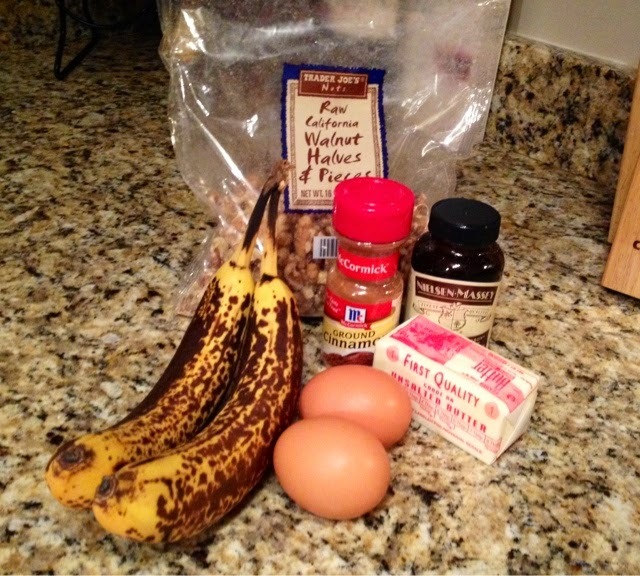 Mix this until it's combined with the banana mixture, about 1 minute. 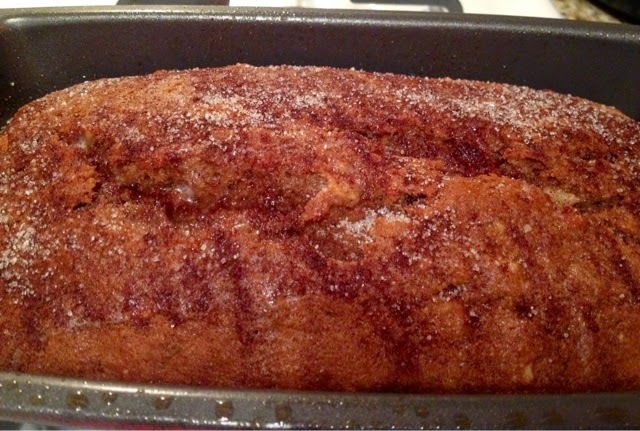 To this add 2 cups of flour (I use white whole wheat flour), 1 tsp baking soda, 1 tsp cinnamon, and 1/2 tsp salt. Mix only until just combined! You do not want to over mix this. 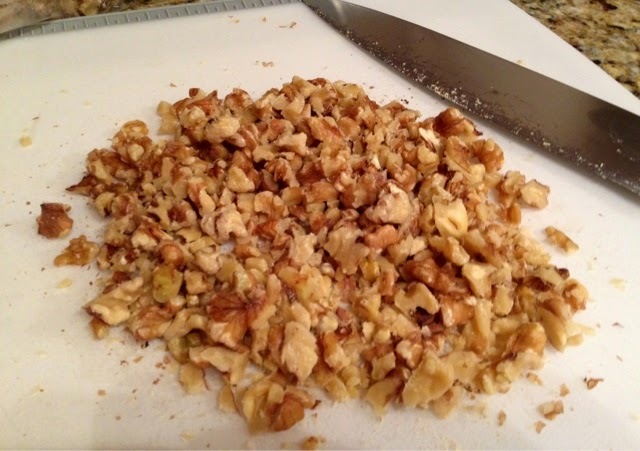 Scrape the sides and bottom of the bowl with a rubber spatula and add in 1 cup of chopped walnuts (raw is fine). 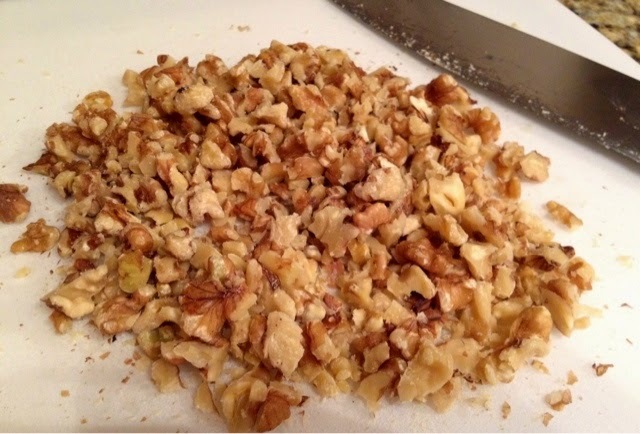 Mix for just a few seconds so that the walnuts disperse throughout the batter. 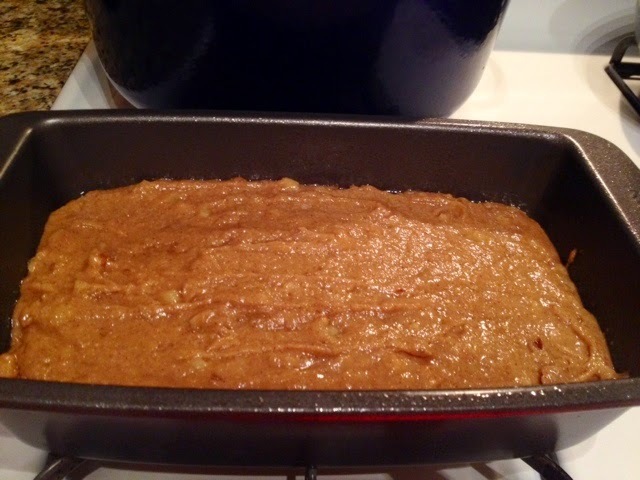 Pour this into a greased loaf pan and bake at 350 degrees for 45-50 minutes. Use a toothpick and make sure it comes out clean. Mine baked for approximately 47 1/2 minutes...I was babysitting it pretty closely! 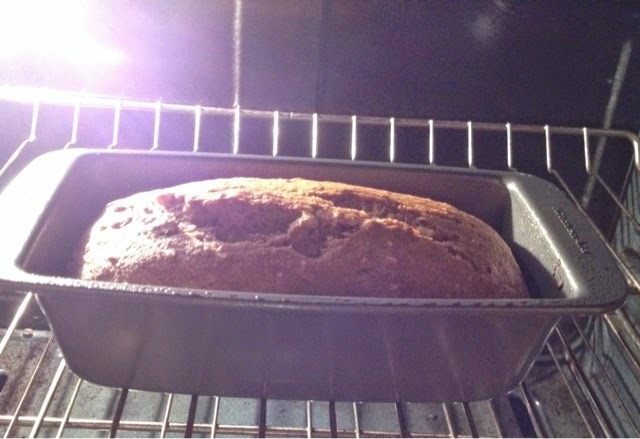 Right when it comes out of the oven it's very important to add this step that my mom does...it makes a huge difference! Melt 1 tbl of butter and drizzle it all over the top of the bread. 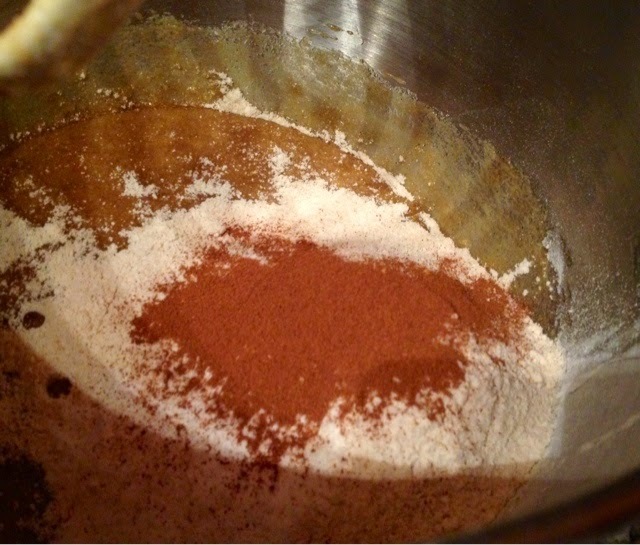 Then, sprinkle on cinnamon and sugar and let it rest for a few minutes. 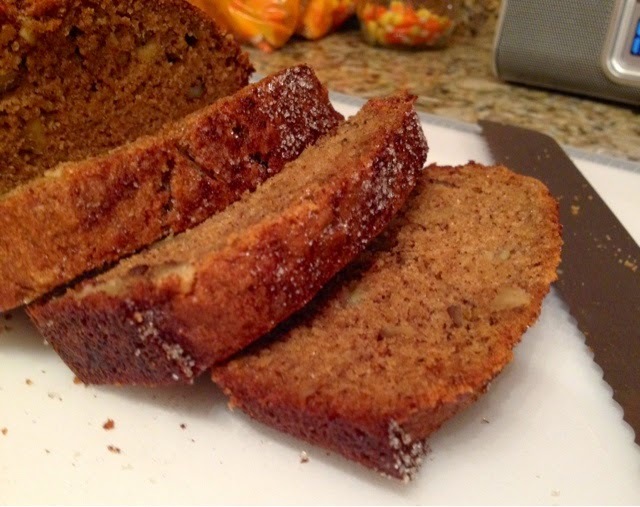 This creates this sugary crust that without it, would just be a waste of truly great banana bread. 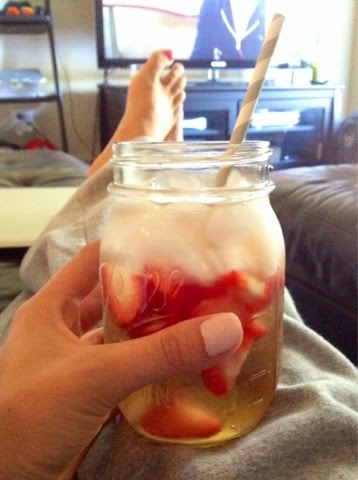 This is great for breakfast, snacks, or dessert! 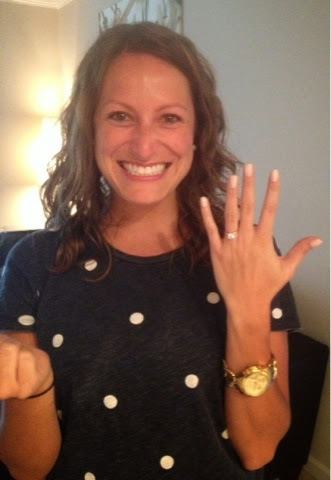 Holy cow...I'm engaged!! Still feels so surreal yet completely natural to look at my fiancé with the same adoring love as I did before he popped the question. 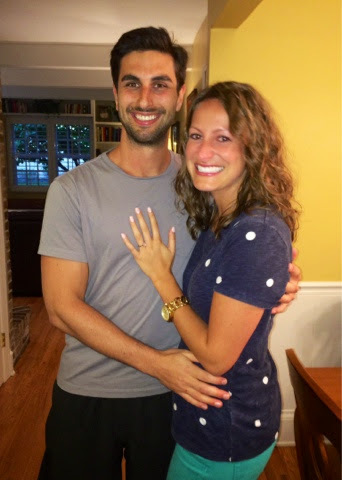 Even though we talked about our future and when an engagement might take place, there was no preparing me for that moment in my life that I've dreamed about my entire life. 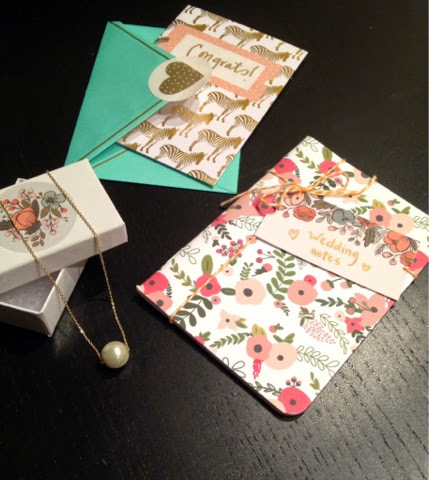 It was exactly how I'd have wanted it and I'm so happy that he knows me well enough to keep things low key! 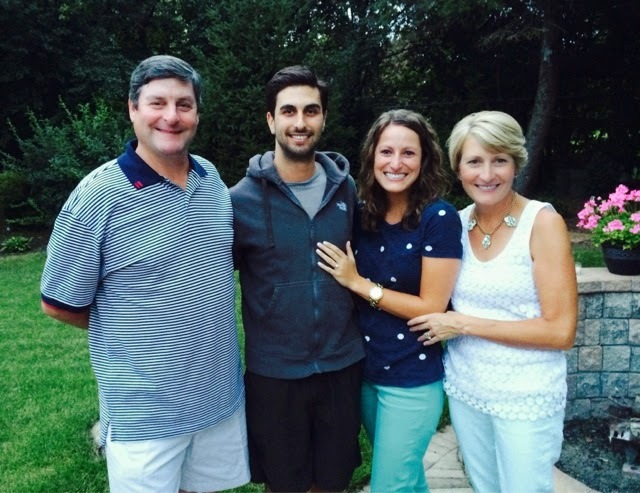 Growing up in such a loving home I saw the level of love my parents had for each other and I always asked, "but how did you know they were the one?" Their reply was always simply, "I just knew". I never knew what this meant or understood how I would "know" until I met Sean. Well actually, before I had even met him. 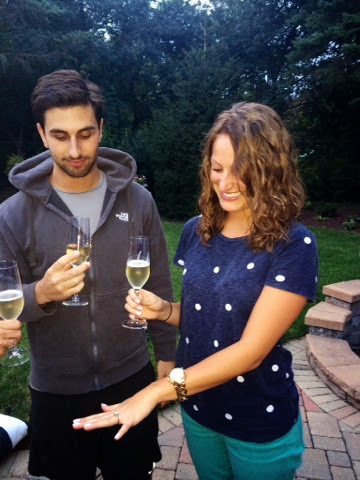 Embarrassingly enough, we met on an app called Tinder, which I never was on to find my soul mate but because my roommate at the time told me about it and I figured I had nothing to lose. I was on it for a few weeks and then neglected it for a few months until a week before my college roommates wedding, and rediscovered it again. 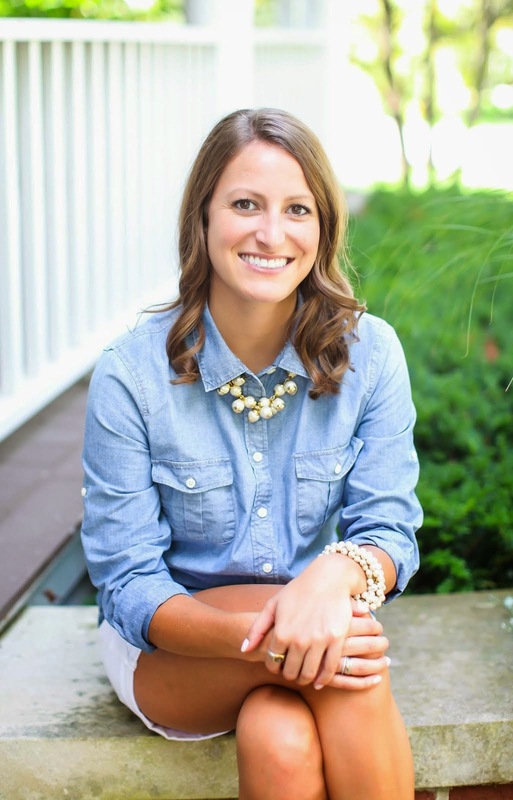 As fate would have it, I knew I was in love with him prior to even meeting him in person. I know, I know. It sounds incredibly cliche and unoriginal but I truly sent my mom a text one day after texting with him, "I'm in love and I don't care who knows it!!" (a quote from my favorite Christmas movie, Elf.) She has the text to prove it! I met him just 4 days later, after my college roommates wedding, and the rest is history. My life has never been the same since he came into my life and I have never felt more like myself than now. 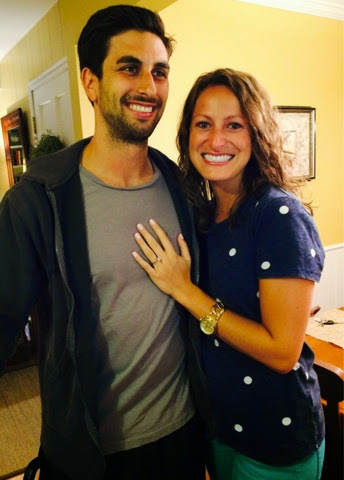 I feel incredibly blessed to have found him and look so forward to spending the rest of my life with him! 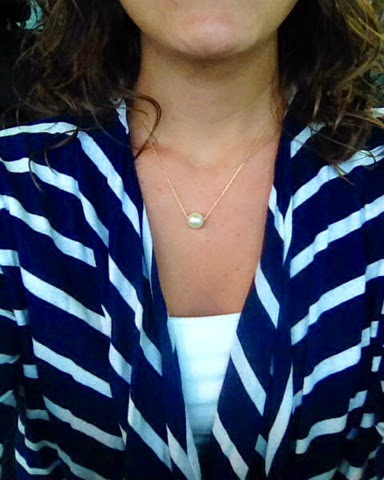 As you can tell, I'm on cloud nine and I couldn't be more excited for the next chapter of my life. 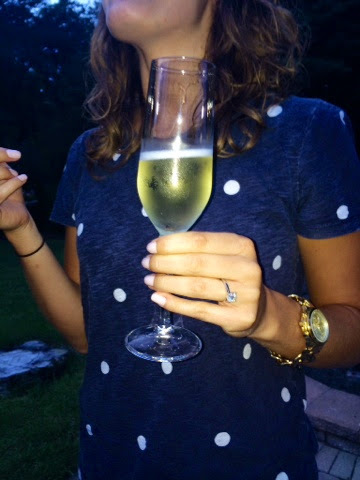 Now...the wedding planning begins!! Even though we've had some rainy days with air so thick and humid you could cut it, our warm summer days are expiring quickly and I must enjoy every last minute of it! Looking at the 10 day forecast we're going from 82 degree days to highs of 60. I better move quick! The other day at the grocery store I saw gorgeous heirloom cherry tomatoes and knew exactly what I wanted to do with them. It's taken me several years but I truly enjoy tomatoes now. I can happily pop a whole cherry tomato in my mouth but prefer them with a light sprinkle of salt...like real salt...none of that iodized table salt...save that for baking. 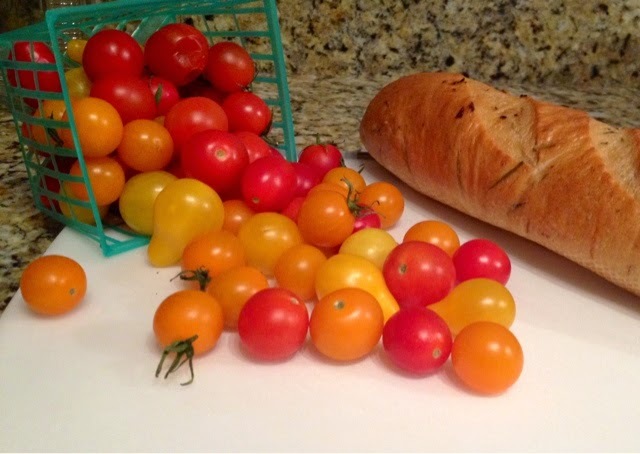 I grabbed fresh basil and a mini baguette with rosemary and garlic. The original looked good too but why not elevate the goodness? 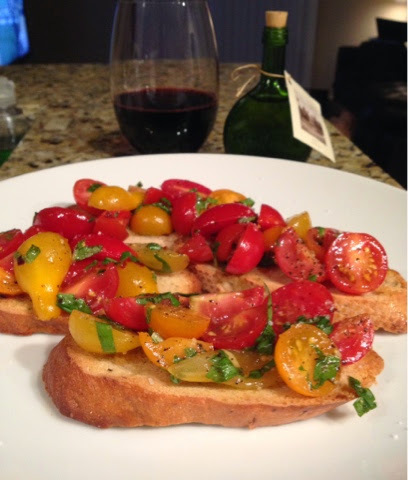 Anyways, I decided a fresh tomato "bruschetta" was what's for dinner. Since Sean had hockey I was on my own for dinner and therefore didn't need to serve meat! 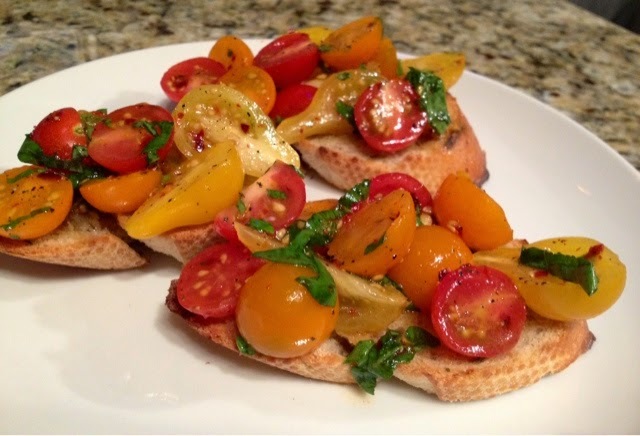 I sliced and toasted the baguette (enter the fancy word crostini) and marinated the tomatoes for a few minutes in extra virgin olive oil, salt, freshly ground black pepper, red pepper flakes, a splash of white balsamic vinegar, and chopped basil. Oh my goodness...I'm telling you, nothing tastes fresher or more like summer than this bright and simple dish. It's ridiculously easy and looks beautiful for entertaining. 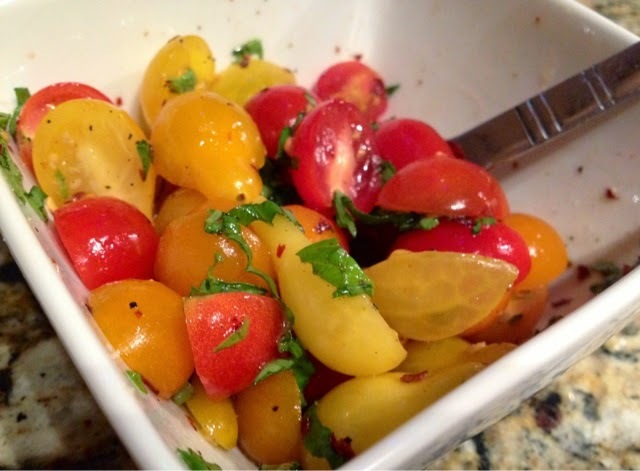 Serve them on a white platter to bring out the colors of the tomatoes and let the food shine. 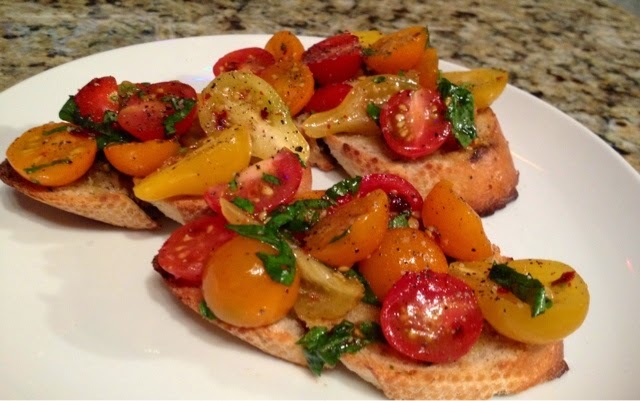 Drizzle the extra liquid that collects in the bowl (from the vinegar, oil, and water from the tomatoes) over the tops of the crostini for extra flavor, don't leave that behind! 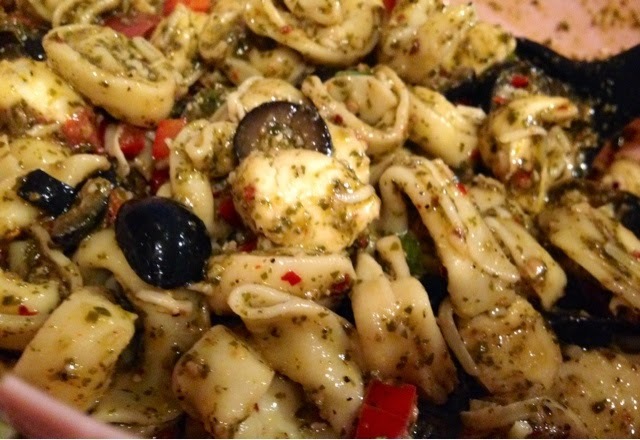 Alternatively you can finish with a little infused olive oil for great flavor! 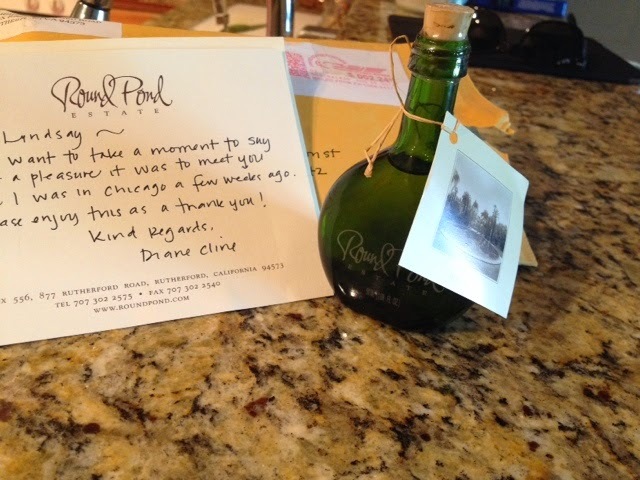 I just received this thoughtful letter and sample of basil olive oil from one of my favorite vineyards in Napa, Round Pond, (see below from my Napa post) and it was so delicious! It definitely enhanced the basil flavor and added additional depth to the dish. Thanks Round Pond!! The only productive thing I did yesterday was make a pasta salad that I made for Sean's surprise party a couple months ago. A friend had asked for the recipe and I had to really think about what the heck was in it. It was one of those "ohh shoot...what did I put in there?" moments but I think I pulled it off. It was pretty simple but here's what I did. 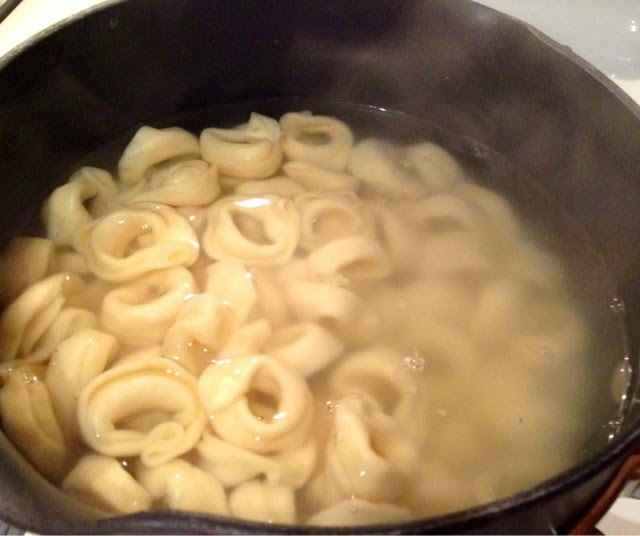 Cook a package of tortellini, whichever you like. 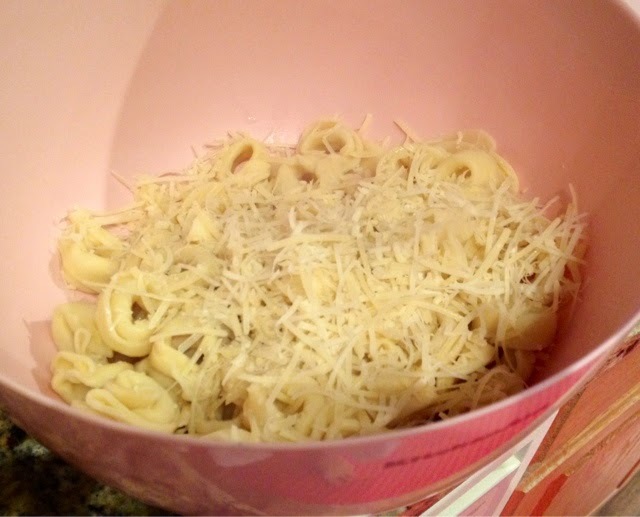 I used regular cheese tortellini. Cook according the package directions, about 4-5 minutes. Meanwhile, prep your veggies. 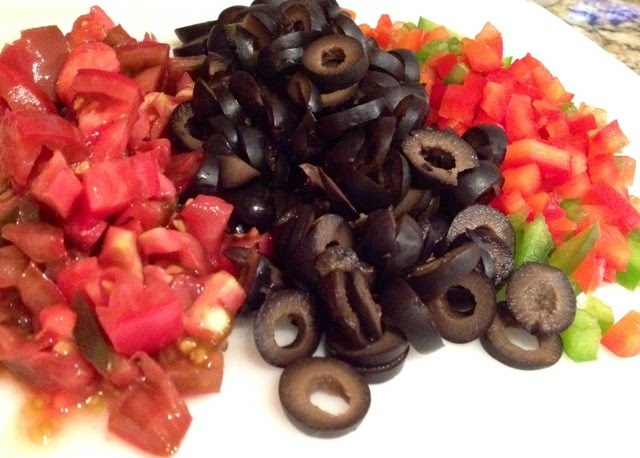 I diced about 1 cup of heirloom tomatoes (or halved cherry tomatoes), 1/2 cup diced bell peppers, and 1 cup of sliced black olives. 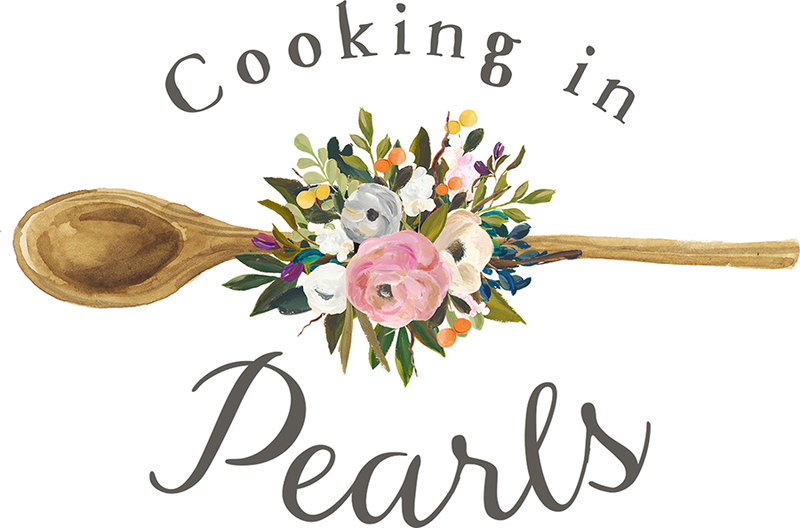 For the party I had used diced buratta cheese but today I used fresh mozzarella pearls. Then, add in 1/2 cup of basil pesto (store-bought or homemade), black olives, bell peppers, and tomatoes. Stir to combine. 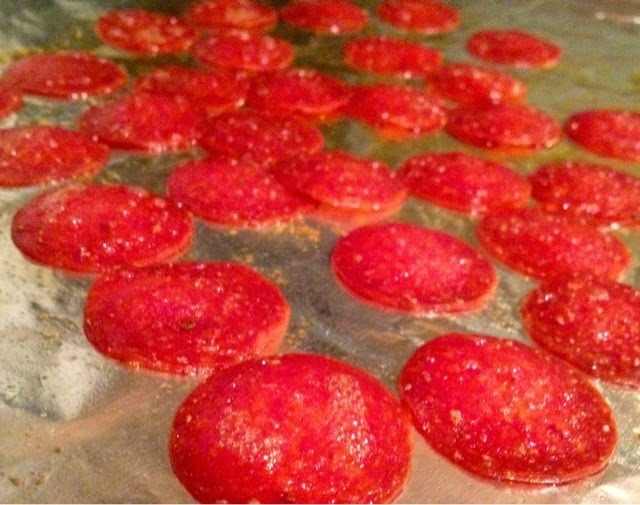 Place 1 cup of pepperoni on a foil-lined baking sheet and bake at 375 for 5-10 minutes until crisp. When your ready to serve add in the pepperoni and toss to combine. Season with salt, pepper, and red pepper flakes to taste. That's it! 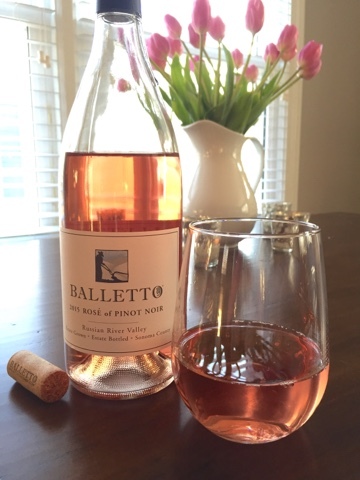 Easy and delicious served alongside grilled chicken, burgers, brats, etc.